Appearing Flowers in a Greeting Card. Make an impression of love and appreciation? The simple things you do make a big impression. Show your appreciation, say “Thank you” or “I love you” and make someone feel special by including flowers in your greeting cards. 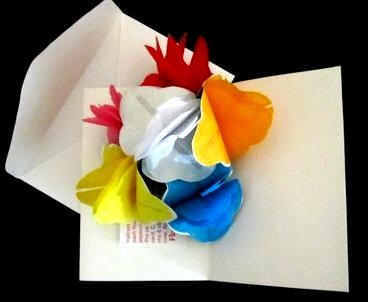 Flowers4cards are a simple bouquet of paper flowers that fold flat to fit inside of your card and when the card is opened, the flowers spring out into a beautiful bouquet. Buy 3 at $3.00 each and we pay the shipping within the USA & Canada. Thank you for allowing me to help you spread joy and happiness to the world.